Now, the Special English program "Words and Their Stories". Our expression today is "Santa Claus". Santa Claus is someone who will remain in the hearts of children forever. He is the make-believe person who brings toys and other gifts to children at Christmas. To grown-ups, he is a special symbol of goodwill and selfless giving. Santa Claus also has some other names: Saint Nicholas, St. Nick, Kris Kringle, Pelznickel. Two of his names – Santa Claus and Saint Nicholas – both come from the Dutch who settled in New York long ago. The Dutch believed Saint Nikolas gave gifts to children. They honored this kindly saint with a yearly festival on December sixth. The English-speaking people who lived nearby greatly enjoyed Dutch festivals. And they brought the saint and the custom of giving gifts into their own celebration at Christmas time. The Dutch spoke the name "Saint Nikolaas" very fast. It sounded like "sinterklaas." And so, when the English said this word, it sounded like "Santa Claus". West of New York, in Pennsylvania, many German farmers had also heard of Saint Nikolas. But they called him Pelznickel. This word came from "pelz," meaning fur, and "nickel" for Nicholas. And so, to the Germans of Pennsylvania, Saint Nicholas or Pelznickel was a man dressed in fur who came once a year with gifts for good children. Soon, people began to feel that the love and kindness Pelznickel brought should be part of a celebration honoring the Christkindl, as the Germans called the Christ child. After a time, this became Kris Kringle. Later, Kris Kringle became another name for Santa Claus himself. Whatever he is called, he is still the same short, fat, jolly old man with a long beard, wearing a red suit with white fur. 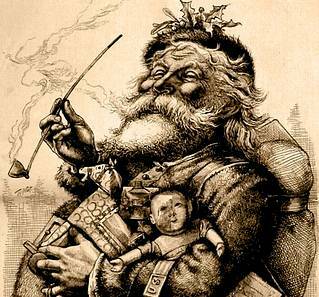 The picture of Santa Claus as we see him (check it up above) came from Thomas Nast. He was an American painter born in Bavaria. He painted pictures for Christmas poems. Someone asked him to paint a picture of Santa Claus. Nast remembered when he was a little boy in southern Germany. Every Christmas, a fat old man gave toys and cakes to the children. So, when Nast painted the picture, his Santa Claus looked like the kindly old man of his childhood. And through the years, Nast's painting has remained as the most popular picture of Santa Claus. Santa can be seen almost everywhere in large American cities during the Christmas season. Some stand on street corners asking for money to buy food and gifts for the needy. Others are found in stores and shopping centers. It is easy to find them by the long lines of children waiting to tell Santa what they want for Christmas. If one took a vote among children to learn who their favorite person was, there is no question who would win – Santa Claus. almost everywhere: casi en todas partes; in large: en las grandes; Christmas season: temporada navideña; some stand: algunos se paran; on street corners: en las esquinas; asking for: pidiendo; for the needy: para los necesitados; others are found: a otros se los encuentra; by the long lines: cerca de las largas filas (colas); waiting to tell: esperando decirle a; what they want: lo que desean; if one took a vote: si emitiéramos un voto; among children: entre los niños; to learn who: para saber quién; their favorite person was: es su persona favorita; there is no question: no cabe duda; who would win: quien saldría ganador. This VOA Special English program "Words and Their Stories" was written by Marlilyn Christiano. I'm Bob Doughty.